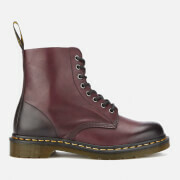 Dr. Martens Boots in high-shine burgundy leather with a six eyelet laced upper and a chunky outsole. 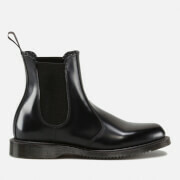 Hand made in England with a Goodyear welt, the Arthur boots feature a heat-sealed upper and sole that are sewn together for durability. 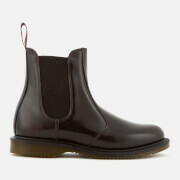 The classic design is finished with a branded heel loop and a comfortable air-cushioned sole. - A.D.